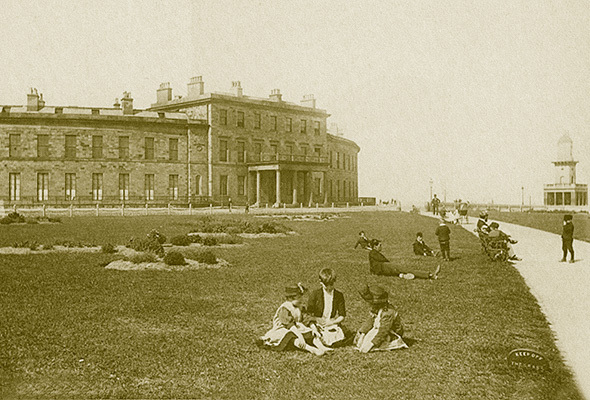 Shown in this postcard from the beginning of the century are two of Sir Decimus Burton’s most famous Fleetwood building, the North Euston Hotel and the Lower Lighthouse on the right. The “keep off the grass” notice is being disobeyed, although the top-hatted gentleman approaching in the distance, who may have been a Town Commissioner, would perhaps see to its enforcement. The blinds of the hotel are drawn as at that time the building was empty. In 1861 it had become Euston Barracks, the first detachment of officers arriving at the new School of Musketry. In those days the original crescent shape included Bellevue House, built on the corner of Bold Street in 1845. This house belonged to George Laurie, chemist, and was occupied by the Reverend St Vincent Beechey, first incumbent at St Peter’s Church. Image and text © Catherine Rothwell.